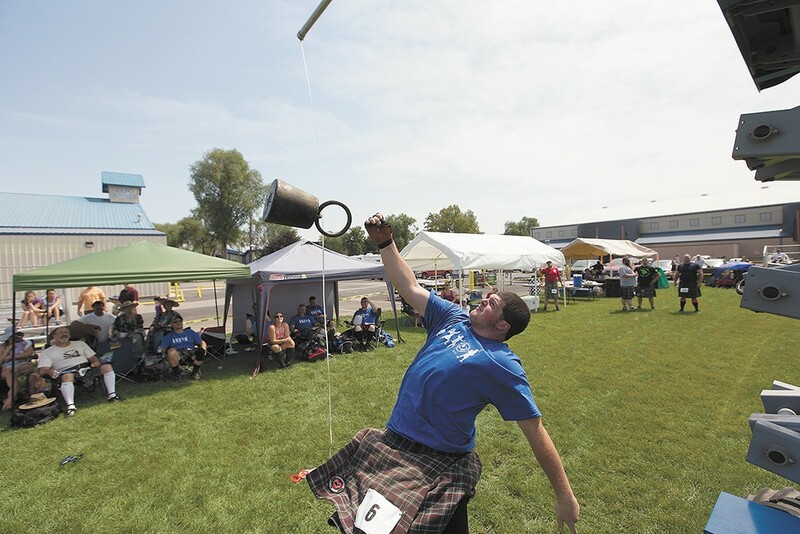 The annual Spokane Highland Games feature a number of traditional Scottish athletic events. Brightly colored tartan, beefy men in kilts flinging iron weights with all their might, the plaintive lament of Highland bagpipes playing Amazing Grace. You needn't be Scottish to attend or even appreciate the Scottish Highland Games this weekend. Featured are demonstrations — sheepherding, blacksmithing, the adorably shaggy cattle known as Heilan' Coo — live music, food (aye, there will be haggis, and beer of course), children's games and clan booths. Competitions include dance, bagpipes and athletics, the latter hosted by a figure on par with Sean Connery for hunkiness: former World Highland Games champion and International Highland Games Foundation founder Francis Brebner. 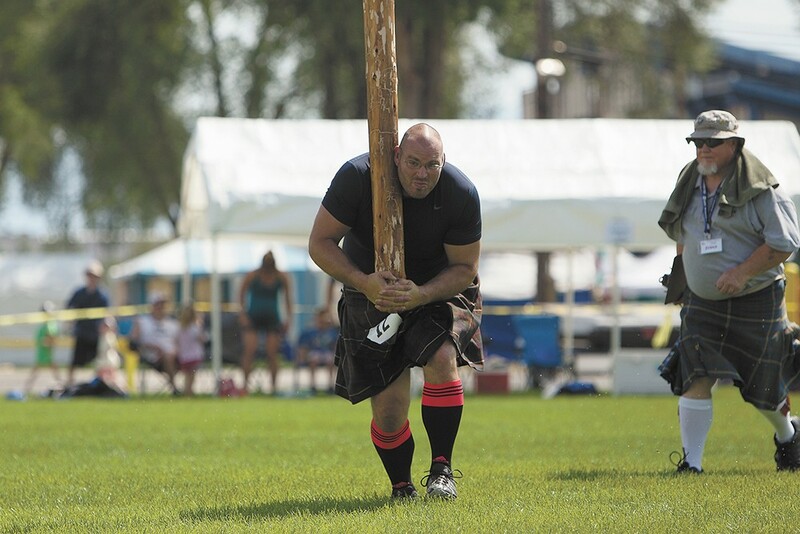 "Each of the athletic events we have in the modern days has a connection to ancient culture," says Spokane Highland Games chairman Sean Pelfrey, who competes at games throughout Idaho, Montana and western Washington. The caber toss, shot put, and tug of war, says Pelfrey, "correlated to ways to train without having a traditional weapon" after the British Act of Proscription. That period of oppression in the mid-1700s — it was post-William Wallace (think Mel Gibson in Braveheart) but related to the country's longstanding rebellion against foreign rule — forbade weapons, as well as speaking Gaelic, playing bagpipes and anything to do with clans, including wearing tartans. Warfare, and the Scots' indomitable spirit in the face thereof, plays a central role in Highland Games, which date to the 11th century (and may be even older, as Neolithic humans occupied Scotland from 10,000 BC). Invaded by Romans, then Vikings, Scotland established its first kingdom around the 9th century and may have used the games to identify the most worthy, stout-hearted warriors. At 22 pounds, says Pelfrey, the shot being put could crush a man's skull. The caber toss was developed as a military training technique in Scotland. Scottish dance in the Highland style — Highlands is both the geographic region along northwestern Scotland, and a culture of clans and Celtic language, etc., most recognizable to modern audiences — is similarly related to warfare. The Sword Dance, originally performed by men, may have been done to demonstrate prowess, anticipate a battle or narrate a past victory. In addition to dance, "bagpipes are an outgrowth of a long military tradition," explains drummer Kenyon Fields of Spokane's Angus Scott Pipe Band. Likely adapted from the Anglo-Normans (Romans), bagpipes were used to rally people, and were used alongside drums to maintain marching pace in the British Army, which helped popularize the Highland bagpipe. While the Highland Games are a celebration of triumph over tragedy, says Pelfrey, they're also about community. The St. Andrew's Society, which in the Northwest numbers about 120 members, is one of many Scottish culture affiliates whose history is linked to the games. The society formed in 1955 as an offshoot of the first Scottish Picnic Association, as it was then known, first held in 1936 in Kellogg, Idaho. The annual event relocated to Coeur d'Alene's City Park, where it was held until 1978. The following year, it relocated again to Spokane under the guise of the Spokane Highland Games Association. Scots organizations brought like-minded people together and kept the interest in Scottish culture going, says Fields, an alumnus of Shadle Park High School, built on land donated by the family of Eugene Shadle of Clan Henderson; the school mascot is the Highlanders. People like Bill Thomas, who founded the school's pipe band in 1957 — and at age 85 still plays with the Angus Scott Pipe Band — inspired him, says Fields, whose daughters both participate in Highland dance. Dance hooked Kasey Hawkins, too. "Dance in itself is just such a fun art form for anyone to express themselves," says Hawkins, who along with younger sister Victoria recently represented the Northwest at the United States Inter-Regional Championship — considered the Olympics of Highland dance — placing in the top six nationally for their age brackets. Scottish dance, says Hawkins, "not only has the dance aspect, it has the cultural aspect, the teamwork — the Highland dance community is such a tight-knit community — the competitions ... all the stuff that would happen at a festival." Hawkins, along with eight other students, will compete at the Spokane Highland Games in the morning, prior to the opening ceremony at noon. Occurring about midway through the festivities, the ceremony, says Pelfrey, is "our way of thanking everyone for coming down and enjoying our heritage and our culture."